Looking for another nonlethal way to take down suspects, the Anderson Police Department decided to go the way of the dragon. The police force in the Northern California town of about 10,000 people plans to equip its 20 officers with nunchakus, also known as nunchucks. Basically, they’re what martial arts legend Bruce Lee used – besides his fists of fury and feet -- to take down all those bad guys in his movies. The police department was looking for a versatile tool that would limit injuries to officers and the people they detained – but that would still be an effective means of subduing an unruly suspect. Anderson’s top brass decided nunchakus were the way to go, said Sgt. Casey Day. “It gives us the ability to control a suspect instead of striking them,” he said. Of course, if you’ve watched enough Lee movies you’ll notice that he didn’t use nunchakus to pacify his enemies. He beat them up with them. But Anderson police insist they can detain someone with them in a relatively peaceful way. On the website of the nunchakus’ manufacturer, Orcutt Police Defensive Systems Inc., the restraint technique is demonstrated. It shows a male officer using the nunchakus to grip the ankle of a man who is kicking his foot toward the officer’s face. The photo also depicts a female officer using them to hold a man’s wrist. The weapon, or tool, is often made of two wooden sticks or bars tethered together by a metal chain. (Developed by retired Colorado police Sgt. Kevin Orcutt in the 1980s, the Anderson Police Department's nunchakus are made of a hard plastic connected by a nylon cord designed to wrap around wrists and ankles). 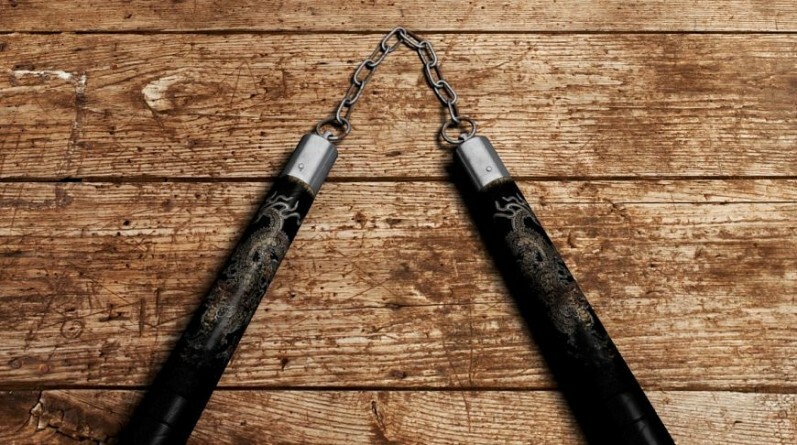 Wielded by martial arts experts, nunchakus can be used in complicated motions to fight off attackers. In the movies, including some of Lee’s, the occasional bad guy who gets the bright idea of trying to use it himself usually whacks himself in the face. Day was recently certified to train the department’s officers on the proper use of the nunchakus. He wants officers to have another option besides the baton, a traditional impact weapon. Officers won’t be required to use nunchakus, he said. But if officers decide to use them, they must pass a 16-hour training program. Day, a 15-year police veteran, said he has given up his baton for nunchakus. “I see the value and the safety they bring to me,” he said, adding that nunchakus provide a distance between an officer and a suspect. Sure, he was skeptical at first, Day said. But once he used the nunchakus, he was sold. 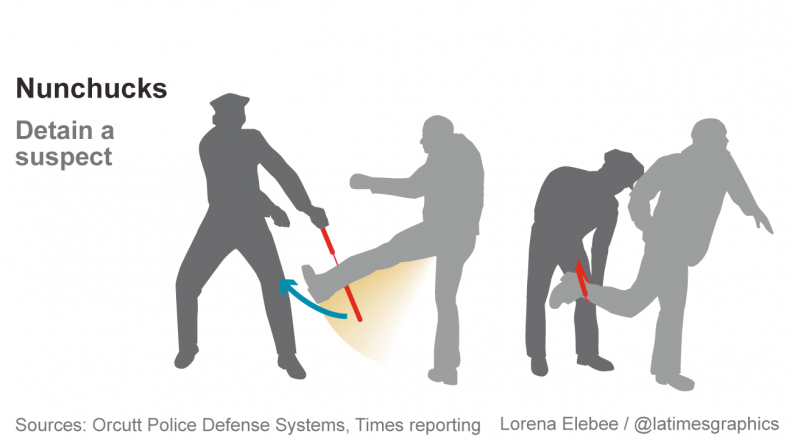 The pincher-style nunchakus became popular in the police community in the 1980s, said Greg Meyer, a use-of-force expert and former Los Angeles Police Department training captain. Anaheim, San Diego and the LAPD are just some of the agencies that have used them– at least for a while. Some law enforcement agencies stopped using nunchakus when officers improperly used them -- in some cases resulting in broken wrists, he said. In 1991, the LAPD agreed to stop using nunchakus at protests– a decision sparked by a federal lawsuit filed by anti-abortion activists. The department opted to settle the lawsuit following the March 3 beating of Rodney G. King, which happened that same year. At the time, Deputy City Atty. Jack Brown, who was representing the LAPD, said the department was concerned about the public perception over using nunchakus to subdue people. Day hasn’t used his nunchakus, but is confident he will use them properly. “I don’t go around looking for trouble,” he said.